"Let's go to the lumber store," Russell's dad said. They roamed up and down the aisles. Russell's dad looked lost until a man in an apron came to help. Russell showed him the plan. The man in the apron sold them tools and lumber, and when they got home, they spread everything out in the back yard like an enormous puzzle. Russell nailed his plan to the fence ... "
Russell loves the huge tree in his new backyard. It spurs thoughts of fort building, and he is quick to share those thoughts with his father. Dad has little building experience, but Russell remains positive, designing the plans for a praiseworthy structure. Dad is willing; off they go to the lumber store! sweet smell of fresh-cut wood. dad admitted. "Or escape slide," he added. Their first night in the tree fort is just as Russell imagined it to be. While bird watching the next morning, he notices a crew setting up to build another fort in a neighbor's yard. It is something when completed - with turrets, an escape slide, even lights. Russell is keen to see it up close. 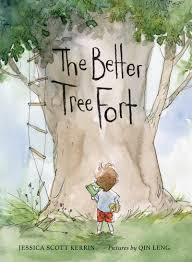 He introduces himself to Warren, the owner and lone occupant of the 'better' tree fort. He cannot help but be impressed! He discovers that Warren's dad ordered the plans, hired the crew to build it, and it is missing a kitchen sink. The boys agree that somewhere there is a fort with a kitchen sink. Does that make it 'better'? 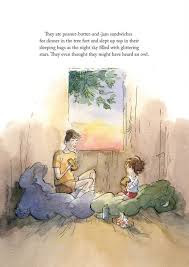 Once back at home, Russell and his dad climb the rope ladder to their lofty home. Their fort may not be as luxurious as Warren's; but Russell's dad is pretty darn fine, isn't he? Father's Day will soon be here. Looking for a gift for that special dad?